With the Salmon run gearing up and the seasonal enthusist lining up on the shores, I would like to invite some to educate us on proper techniques for catching salmon. I would LOVE to avoid discussion on terms such as snagging, lining, flossing etc. This is a great opportunity to educate those looking catch thier first salmon and possibly extend that knowledge to other river run species. So please, gentlemen, lets not beat a horse to death with a bag of marshmellows. Personally, I like the salmon action with spoons. Glo Cleos, spade williams, I'll even toss a bright orange cyclops. But when all the anglers come out and it's shoulder to shoulder out there, spoons can make a mess o' tanglled lines out on the tribs and thier mouths. True, most people have the egg sinker on bottom and in line #3 wide gap with anything that'll float, and most time your option is to get a space in between and hope your setup wont float into all others' downstream. In this scenario, barring from the cynical "stay home" comments, what is the best bet for catching salmon, beside spoons? I've read here salmon skein works wonders. Is that the belly fat off a harvested fish? It sounds like a very interesting method. I would love to try it if those would be as kind to enlight me on how to rig it and the best environment use (trib mouth, 10m wide trib, etc.). Your experience and candour is much appreciated. Again, as this discussion can EASILY get side tracked, I appeal to respondents to advocate proper techniques and maybe even share some river etiquette. Thank you those who respond in kind. Ok back when dinosaurs roamed the earth I received two seperate lessons on Bronte Creek. 2nd Later on in the cold weather up higher I received another lesson from a fella I met on the creek---he was drifting a perch coloured countdown rapala into the deeper holes (tried blue later--worked). It was impressive. Trust this is non-confrontational enough. lol. Well done Bushart. So did he have the rapala weighted some how? That's what I'm looking for specifically, the rig set up. I would guess, just a guess, a heavy sinker tied to a three way and the countdown on a 2 or 3 foot lead? Skein is immature eggs still attached to the membrane if I'm not mistaken. No actually there,s not really enough water for that and the countdown sinks and dives pretty well on it's own. This business of catching salmon off the piers is pretty serious. For a lot of people, much like myself, the only opportunity to get at a good, legit salmon, is when they're staging at the rivermouths. The run is generaly quite short.. 3 weeks, 4 maybe. Even shorter is that window of opportunity when fish can be had by methods other than downrigging off of a boat. When it's shoulder to shoulder, I move on. When it's that tight, things can get pretty hairy. I've seen conflicts between spoon throwers and bottom bouncers and it's all because of close proximity. Regardless of methods used, lines are bound to get crossed, even with the most adept fisherman. Anglers fishing stationary who hesitate to reel in when someone has a fish on will often have that hooked fish swim into their lines, and that's when the words come out and fists get clenched. I prefer to toss cleos myself, but only in open water, where snags are less likely. However, in some areas, like in Ashbridges for example, the water is shallow and weedy. 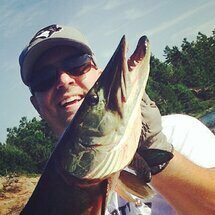 That's when we break out the raps... Rattling Raps, Jointed, HJs and countdowns will all produce fish. They cast well and you can work them at various depths. And they catch fish!! When they're stacked together, there will always be a few that hit out of aggression, so casting a firetiger jointed or shad rap over them is a great, legit way off hooking up. Skeening is another good technique that seems to really produce fish. I've seen people have field days on them. Cuts of skeen are bulked on a wide gap octopus hook, fished off a float or egg sinker. I don't know weither is hunger or agreession.. Hard to believe a fish will eat it's kind, so close to the spawn. But they certainly work. However, there is always going to be a salmon carcass nearby. The smell of rotting fish late in the fall bears a grim reminder of this carnage. How are you guys making out at Port Credit? Should we have a gander at her this weekend? Dang, I was gonna take a walk down to the charters and rifle through the trash bins looking for belly meat. lol. You just saved me from a huge embarasment BillM, hahahaha. Anyone know how to rig up skein? If it's the same method as 'mallows blink twice lol. I like to cure the skein with pink coloured pro-cure. Once cured it'll last in the fridge for up to a month. Leave the entire skein intact and cut off chunks for bait as needed, usually toonie sized or larger. You can incorporate an egg loop on your hook to keep the skein in place. Personally I don't find that necessary. As mentioned large octopus style hooks work well, I usually use the fluorescent coloured ones in size 4. Float fishing all the way with one tip: don't be afraid to run an extremely short lead, much shallower than the actual water depth. Sometimes you'll get 10x the number of hits that way. Bear in mind I'm talking about rivermouth/estuary fishing here....not up river. Now is the time to do it, so get out there and have fun! Silver Hot Shot or jointed Brooks Reefer. Nice. I was hoping you guys would chime in. Thanks Solo and Highdrifter, your knowledge and experence is very much appreciated. On a personal note, I just was introduced to the Salmon run last year, and I lived so close all my life!!!! Well, alls I can say is, my mentors showed me the wrong ropes (floss) and I'm trying to get educated on best practices out there to pass on. Highdrifter, I went out once thus far and got laughed at by some jumpers, 'bout all. went for a little walk along the bank talking with anglers lastnite and they had much the same story. I will put your methods to practice soon. Dont feel too bad reefrunner, I thought Salmon skein was just a membrane holding the eggs untill solopadler helped out explaining what it was. I was seriously going to keep the membrane and put it on the hook and fish like that. So Solopadler thank you for the explanation, never really thanked you in that tread, you explained a lot to me. glow cleos, fortune spoons, buzz bombs, cyclops, jointed rapalas, rattlin raps, rattle spots, bigger xraps, bomberAs, quik fish, j plugs, and glow spoons you get in the bargain buckets all effective on the pier and in the inner harbours and the big deep holes for some of the lures. Rivers and streams i use differeent flies, jigs, roe different spawn bag colours, spinners num 2s and 3s, at night i use 2 in half to 3inch glow twister tails very effectice at night under a float and if the browns are holding in the holes, you usually get them aswell sometimes. My theory on why skien works so well is that the fish are teritrorial and when a bunch of eggs invades there teritory they get agressive and lash out at invading egg cluster! Skien works great for fall chinnies but it's a messy bait to deal with! I also cure it in either hot pink procure or rubby red, it's probably one of the best tactics out there for numbers of fall kings. What is the difference between using a roe bag and the salmon skien?? My guess, Marko, is that the skein keeps it all together and its immature roe. Whereas a roe bag is one of those mesh bags tied with mature roe. I am by no means an expert, just an educated guess based mostly on solo's pic above. I'm curious, back to my original post, as how to weight the skein. I would guess starting from the rod tip -- float, 2 feet line, three-way split, a foot or so of lead with the #4 hook, and another foot or so with a 1/2 ounce egg sinker? And Canadadude... Kings are called Kings cause they can get real big, not because they have a distinguished palet..
Are there any other theories on why salmon would hit skeen? It just boggles the mind when I think about it. Are they that primitive?!! Glad I could help reef, hope to cross lines witcha sometime! Oh and if I may add... Rig up with some strong braid like powerpro or spiderwire. The contact with your lure is almost a %100 (for better hook-ups), it'll resist abbrasion, and you'll be able to cast further, without skimping on line strength... And.. If your line crosses with someone using mono, guess who's gonna havta re-tie! Hard to believe a fish will eat it's kind, so close to the spawn. Not hard to believe if you've raised live breeders in an aquarium. If you leave any others in with Mom they line up under her as she drops the babies to scoop 'em up before they even get opened out. Trials and tribulations of nature, but still disturbing. River mouths: Cleos, crocodiles and larger x-raps (3/4 oz): Equipment St. Croix Avid 9 1/2 ft baitcasting rod and 300 Curado. 30 lb braid, my battles do not last more than 5 minutes. I do not like waiting 10 - 15 minutes for another pesron using lighter gear holding up everyone else. In the river, you will not see me until October thru December, when the circus ends. I have seen enough of it the past years. Floatfishing: Single or double Extrude eggs (plastic) works like a charm on those rainbows.